So the Bucks just drafted Jabari Parker to pair him up with Giannis "The Greek Freak" Antetokounmpo, who is apparently now officially 6'11". With a support group filled with young guys with loads of potential - i.e. Brandon Knight, John Henson, Larry Sanders, Khris Middleton, Nate Wolters, Damien Inglis - the Milwaukee Bucks franchise is on its way back to relevance. There is still some fat to trim in Mayo, Ilyasova, Pachulia and Delfino, but this is definitely an exciting young team to watch. Anybody else excited about the future Oklahoma City Thunder? IMO, before Milwaukee comes back to relevance, they need to get a better coach than Larry Drew. Thanks for making this thread. I didn't want to be the one to do it, but I'm proud to say that I'm a big Jabari Parker fan. Parker is the next big thing, and with the Greek Freak still developing, Milwaukee has a chance to build on something special in the next 2-3 years. They're still a long way to go though; but now MIL games won't be a snooze-fest anymore. I don't expect the team to be contenders right away. It's going to be a long-term process. The great thing is that the team finally has a solid foundation on which it could continue to build. The new owners, Marc Lasry and Wes Edens, have also been great for the Milwaukee community so far. They have not only significantly invested in the team financially, but also emotionally. If Jabari is for real, there is no reason for him not to win rookie of the year... He is the best player of possibly the worst team in the league... adding atleast 15+ more wins this season would be a great accomplishment. Count me in this Bucks bandwagon.. They got length (Greek Freak, Henson and Sanders), a scorer in Jabari and a steady PG. I heard that Inglis guy is good. This team will be fun to watch. Out goes Larry Drew, in comes Jason Kidd. Do you guys think Kidd would more effectively develop the young Bucks? dont roll out the red carpet .... your new coach has a habit of dropping his soda cup. be ready with a big mop because he will make a big mess. it is doubtful because he cant even coach a team filled with seasoned veterans. never liked this guy as a player and as a coach. ang daming drama. divang diva. That happened once, so I wouldn't classify it as a habit. A team filled with over-the-hill veterans who were either out of shape or often injured, you mean. The Nets went 34-17 from January through the end of the regular season. This was after they lost Brook Lopez for the rest of the season as well. I was hoping for objective comments, but it seems your extreme dislike of the guy has prevented you from doing that. I'm hopping on this bandwagon. Akala ko walang fans ng Bucks dito. Hehehe. i think j-kidd is after mallory edens as well. Dude, good luck on your new role. I saw it in my feed. This is a very promising team. 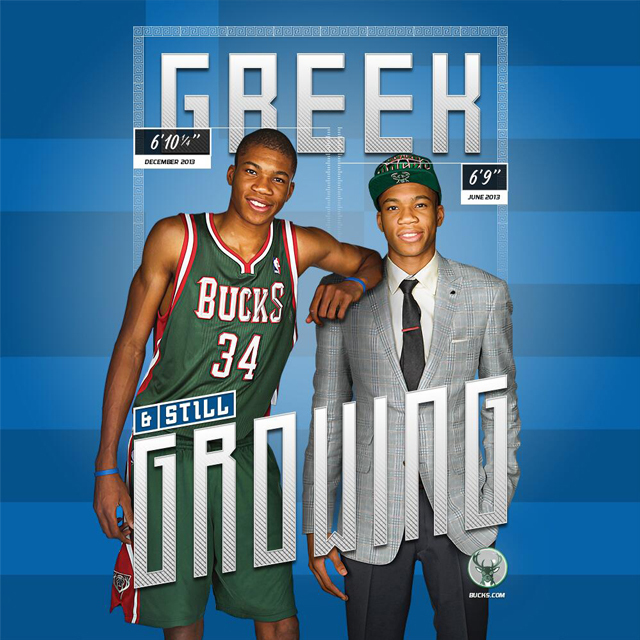 I heard Giannis is still growing now around 6'10'' or 6'11''. Reports are saying Jabari is more NBA-ready than anyone in the draft. I think they are a few years away from contention but it has a solid young core. I'm not sold on Brandon Knight and Mayo as their starting guards though. So who'll play the 4 spot? Giannis? The Greak Freek is continuously growing but he'll need to bulk up soon. I like Giannis at the 2.
WHO CAN SCORE OVER GIANNIS?! Exciting team. The first Bucks @ Nets game will require national TV coverage. I can't say good luck to his new job, but I am simply wishing Jason Kidd won't screw up this young core of Milwaukee. That's not even a question. Kidd will surely make this Bucks team run and gun, just like his Nets teams before when he was still playing. He has an athletic big man who can run and defend the shaded lane in Sanders. A potential superstar in Jabari, and able teammates who can run with him. I think everything was planned by Kidd and the Bucks owners.Try to get fired so he can transfer to Milwaukee.Nice move,very Frank Underwood-ish. Thanks, dude. Loving it so far. Mayo's being shopped. So long as anybody is interested, he's as good as gone. Knight was great last season, but he's not a point guard. I'm guessing Kidd will try to turn Nate Wolters into the next Goran Dragic. Giannis at the 3 and Jabari at the 4, with Henson coming off the bench after Larry Sanders returns. I have a feeling that Sessions, Delfino, Ilyasova and Pachulia will be traded for younger players or draft picks, though. Great for the Bucks since they rarely get national coverage. Haha. As a fan of the Bucks, I appreciate you not wishing ill will on the players. None of this was their fault.